Comprised of returning runners Simon Godwin, Terrie West, Jack Youngren, Tony Fong, Jason Lejonvarn, John Heber and Sherman Bruster, with newcomers Chris Swain, Nathan Knuth, Fletcher Lesley, Colin Soloman and Lanse Whitcomb, the WVTC team, Ottoway's Dirty Dozen took second place overall and finished first in the Men's Submasters Division. Let 1997 go down as the year the Relay lost its innocence. Only three years old, this year saw a doubling of the previous years field, as 160 teams headed out of Calistoga on September 19th, hoping to feel the warm sand of Santa Cruz beach between their toes the next afternoon. While the roads were noticeably more crowded along the course, it was the intensity at the front of the field that was the biggest slap in the face for the runners of WVTC, competing for the second year as Ottoway's Dirty Dozen. Although arriving in Calistoga at the final starting wave as defending champs and course record holders, the disrespect from the other teams comprising the elite start was palpable. The challengers to the throne came from as far away as Madison, Wisconsin, and as nearby as our own Pacific Association backyard. Yes, the East Bay Striders brought their 510 area code inferiority complex and limited interpersonal skills to this year's race. Along with a Central Valley club brashly calling themselves the Tarahumara Savages, but seemingly consisting of not one Native American, these trash talking teams were looking at the Dirty Dozen as easy pickings, as we had the audacity to field a team with a woman and three track-minded runners, for each of whom every leg of the Relay was their longest race of the year. Well, both these teams had another thing coming, as the race unfolded, and they were taught a little lesson on Character. That's right, with a capital C. Tarahumara self destructed early, eventually finishing well behind the steadier and less culturally offensive Santa Cruz Track Club, while the neck to neck battle with EBS seesawed throughout the night. Although faced with all the pressure of defending their title, and with the constant scrutiny of a freelance film crew recording their valiant effort at close range, the runners of Ottaway's Dirty dozen continued to exemplify the spirit of the race. These athletes cheered on opposing teams, stopped to offer water and aid to struggling runners even as the race was slipping away with the approach of dawn, and at one point in the farmland of Petaluma actually stopped to help a distressed cow give birth to a beautiful young calf. In contrast, the Striders, presumably cranked to the gills on steroids and amphetamines, were spotted purposefully running down startled deer with their blood-splattered white van on the winding roads of the Santa Cruz Mountains. Understandably, watching the deficit to East Bay widen in the last third of the race, having to face a loss to the blood-doped miscreants from the wrong side of the Bay Bridge left a very bitter taste in the mouths of the Dirty Dozen, especially the returning runners who remembered the roads into Santa Cruz as being paved with gold. Thus, we have left the race write up to two new comers who are known for their optimism and gentle natures. Nathan Knuth from van 1, and Lanse Whitcomb from van 2 provide poignant recollections of their Relay experiences with a gracious tone which most team members are incapable of assuming. Nate: Overall, the thing I remember most about the Relay was the excellent competition. How often can you go head to head with another team for 19 hours and still be within minutes? The entire evening was characterized by the anxiousness of the race. 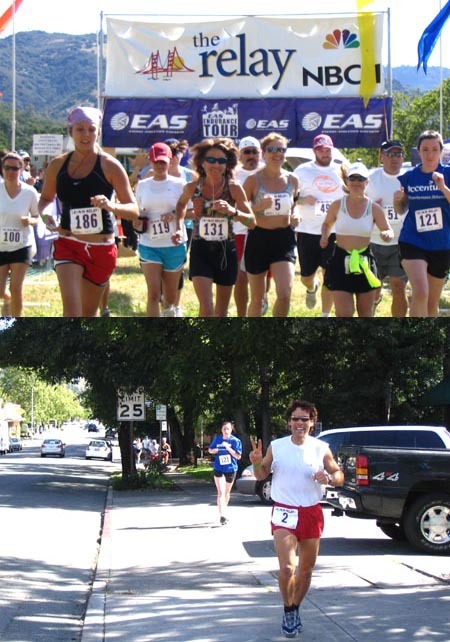 Where was the East Bay Strider runner? Where was our runner? Who do we have on deck? Even when we were relaxing between active sessions, there was Tony Fong still questioning, calculating, and planning out our next turn. As a member of van 1, we were on the road from (roughly) 4:30 to 7:30pm, from 11:30pm to 2:30am, and again from 4:30 to 7:30am. As it goes, there are many moments from the Relay that I will not forget, however, a particular impression from the end of our second leg seems to stand out in my mind. It was just after 2:15 in the morning and I was standing on a hill in the Presidio looking out over the city and the Golden Gate Bridge. We were anxiously awaiting the arrival of our van's last runner. His arrival meant a three-hour break (whether that meant sleeping or a shower, maybe both, maybe neither). The hot afternoon sun from our first session in Napa valley seemed liked a distant memory. Each person in van 1 had just run two very tough legs. We were sweaty, tired, and stiff. The van smelled like a locker room but Terrie West didn't seem to mind. This was the point where people started switching from their depleted physical reserves to draw on their mental energy for the rest of the race. Each runner knew that we could not relax, but that we had prepare for the third leg, now less than three hours away. At the time I distinctly remember not being comfortable no matter what I did. Lanse: Ottoway's Dirty Dozen was anchored by the boys of van 2. Led by Jacob Michaels, the team set out Friday afternoon abound with confidence. 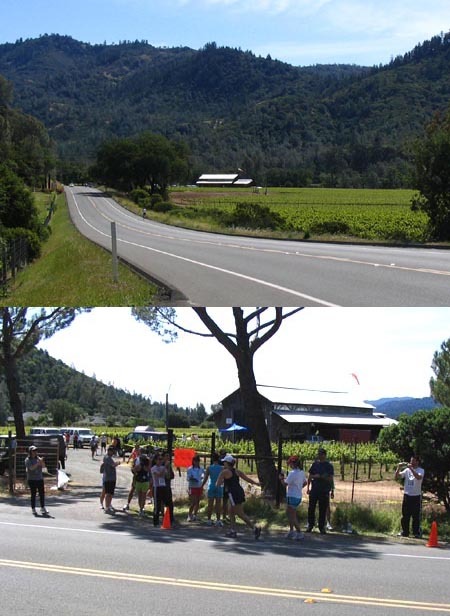 One of the most grueling portions of the relay proved to be the wait from the start in Napa to van 2's first leg run by Jason Lejonvarn. When Jason took the relay bracelet from Tony Fong, the sun had already set and West Valley was already a few minutes behind the Striders. Nobody knew at this point what a challenge this rival team was presenting to us. Fletcher Lesley, best known for his cross-country racing, was paired off in each of his legs against one of the Striders' strongest runners. Through an incredible effort, one that would later result in an unfortunate injury, Fletcher stubbornly fought this Strider off never once allowing the Strider to increase their lead. John Heber followed Fletcher into the night. John ran consistently in all of his legs showing the endurance of a true marathoner. By the middle of van 2's first leg, West Valley was already down by a margin of six minutes to the East Bay Striders. In comes weapon 1: Taz. Colin Soloman, a native of Tasmania, brought wind back to WVTC's sails by blazing through what is the most technical portion of the relay course. By the time Colin had conquered the 6.7 miles of dark, narrow trails and farmland in leg 10, we were within three and one-half minutes of the leaders. Taz passed the bracelet to a newcomer to West Valley, Lanse Whitcomb. Lanse used his strength in the hills to draw even with East Bay for the first time. All of the sudden, confidence poured back into the team. Lanse was followed by the anchorman, Sherman Bruster. Known for his sprinting abilities in short races on the track, Sherman showed his versatility as a runner by conquering the steep oceanside hills. Despite a similar comeback by the boys of van 2 in the second leg, the Striders demonstrated the consistency and endurance that was necessary to fend the WVTC team off. Leg 3 was run with only our pride at stake as the rivals had built up an insurmountable lead. It was at this point that I realized that I was truly running not for myself, but for the team. When Sherman made the last sprint to the beaches of Santa Cruz, we were all proud of our efforts as individuals and members of WVTC. So, that's it. The East Bay Striders broke the course record with a time of 19 hours and 34 minutes. WVTC's Ottaway's Dirty Dozen finished second, only 13 minutes back after 197 miles of racing, improving on last year's winning performance by about 20 minutes. Barring the emergence of a tough drug testing policy at next year's race, there will be a rematch of these two teams in 1998. The rest is just the color, the scenes that will bring the WVTC team back next year, that makes this event, and yes, this team, so special: Simon's tales of lap dancing; the wild ride on the Big Dipper in Santa Cruz; Lanse, John and Jack grooving and doing the limbo on the beach with the young Jamaican girls; Chris' last minute frantic arrival after the race start; Tony running his first leg faster than the astounded cameraman had ever seen a human move; Terrie hammering a savage pace in an attempt to hold off the East Bay runner in Corte Madera; and, of course, the breathtaking miracle of life, as that newborn calf took its first awkward steps toward the outstretched arms of "Poppa" Fletcher Lesley. It was a hare-brained idea. Who in their right mind would cough up 80 bucks to spend two days in a van with five other smelly guys, running head-on into traffic at all hours of the night? Well, it was the East Bay Striders, where foolish feats attract flies like honey! Thanks to the unrelenting effort of team captain Eric Ellisen, the East Bay Striders (EBS) are now the proud owners of the Third Annual Napa to Santa Cruz Relay title, not to mention a new course record, and a couple of keen plaques. It is arguably one of the highlights in EBS club history. Thanks also to PowerFoods and Barton's Bagels for providing the fuel for	victory! Rounding up the twelve fools was probably the hardest part of the job. With only eight guys (including one woman) signed up with a week to go, we had to do some serious begging, lying and threatening. To make things worse, five other EBS fools were already committed to running the Cox Cable 10K road championships in Eureka (which made the Relay seem like time well spent by comparison). By race morning, however, the king and his court were in place, along with their trusty Ford Windstar steeds. At least half the battle was over. Race morning, Friday, September 19th, found the team, cleverly named The East Bay Striders, lounging in the parking lot of the El Cerrito Plaza mall. Ellisen and co-captain Thom Trimble wheeled in an hour late with the aforementioned minivans. Van A, cleverly named 'Van A' would chauffeur the leg 1-6 runners, while Van B, cleverly named.....yeah, not funny anymore... would carry the 7-12 leg runners. A total of 36 legs (3 legs per runner) would be completed before the race was over....hopefully. With the start only 2 hours away in the town of Calistoga Van A had to burn rubber to simply make their allotted starting time. Van B, in the meantime, was able to take a leisurely drive to Napa for lunch to await their early evening jaunts. To facilitate a more compact field, Relay teams were sent off every half hour based on their expected finish times. The slowest teams started at 9:30 AM on Friday, while the fastest departed seven hours later at 4:30 PM. The EBS team was the proud owner of a 4:30 PM start time, along with four other teams. Based on the course profile and EBS talent pool, the team was looking at just nipping under the 20 hour mark, slightly better than the course record. The Striders in Van A were certainly sweating as we made our way north to Calistoga. Not only were we a bit nervous that we would miss the start, but it was hot, probably in the low 90's by the time we got underway. The team checked in hastily (by this time, the organizers had pretty much run out of all the cool, free stuff that our $480 entry fee included), and captain Eric Ellisen prepared to run. In this final starting group, the 'fast' guys, we were seeded with 'Ottaway's Dirty Dozen', the team fielded by the West Valley Track Club (WVTC), and the winning team from 1996. The group started right around 4:30, and Eric assumed the immediate lead, which he held for about the first mile. As things settled in, the team dropped to fourth place out of five starters, and was able to hold that position through the end of the first leg. Eric handed the baton to Strider Ultra maven Ken Gregorich. Gregorich and Ellisen were just coming off finishes in the Pt. Reyes 50K trail race two weeks earlier, so 6:00 pace was about the limit. Ken held his ground and passed off to Rob Flatland. Rob, certainly the dark horse of Van A, smoked his first leg and averaged 5:21 pace for the 4.1 miles along Silverado Trail. During this time, we moved up a couple of places. Next came Barton Goode, who held his own, and was able to pass the 'Dozen' during his leg, and put the Striders into the 'lead' for the first time. We would go back and forth with WVTC through the night, and not cement our lead until sunrise the next morning. Barton handed off to Joe Schieffer, who maintained our position. It was during Joe's leg that the Strider team began picking off teams from earlier starting groups. Over the course of the race, we would pick off a couple of teams per leg, and steadily move up through the field. By the time Joe handed to Brian McGuire, the sun was going down, and we were able to cool off somewhat. 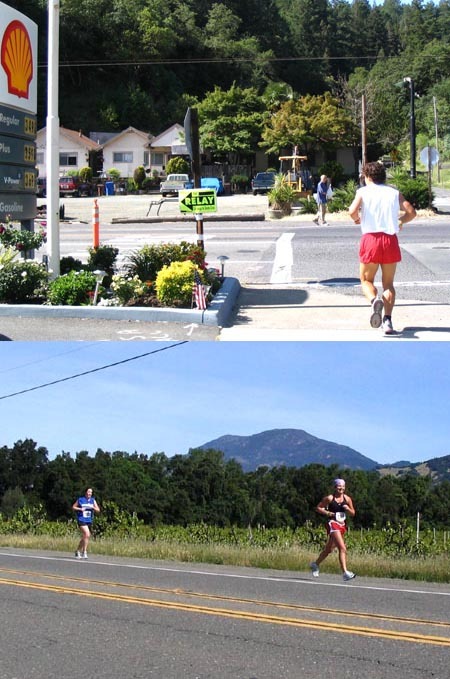 Brian kept our place, but had a dicey moment when he had to fling himself into a busy Napa intersection, and dodge cars; hopefully, in the 1998 edition of the race, the organizers will see fit to institute traffic control at these locations. Brian kept up a 5:27 pace for his 4.5 mile leg, and handed off to Larry Menard, who was the first runner off from Van B. During the first six legs, the team members became acclimated to the group spirit and the teamwork that would be required to make this effort a success. The members of Van A pulled off their journey pretty seamlessly, which was saying something, given 19 hours together in a ripe smelling van with six guys and little sleep. At the point where Van A handed off for the first time, we had a chance to rest at a local church, located by the handoff. Unfortunately, we had a bit of an altercation with the church management, who claimed racers were doing their business in the bushes of their property, so that we weren't welcome. In the midst of this awkward moment, we realized we had the wrong church, so we backed away gracefully, and went to the right place, and crashed in their gym. With the sun ready to call it a day, the Van B dudes were making grass angels in the local park. It was almost dark, we had been up for over 12 hours, and we still had to run three times each before we were done. This fact did not lend itself to warm and fuzzy feelings. The first phone call from Van A, midway through their first set of legs, made our hearts sink a bit. Of the five teams we started with, we were in third. Dreams of an easy victory quickly vanished. Subsequent phone calls changed that as we learned the the Striders had pulled into first and were leading at least the group of five. Last-minute recruit Larry Menard was to run the first leg for Van B, his set of three legs being about the fourth toughest grouping. Larry was also the first to don the required reflective vest and flashlight, as the sun bid goodbye for the next 20 legs or so. Prior to departure we adorned our van with the prerequisite "Ruuners on Road" sign and numerous PowerBar bumper stickers. PowerBars and Bartons Bagels would provide most of our fuel for the next 20+ hours. Van A had pulled out a 3 minute lead over the other top teams and things were looking pretty good. Larry hammered his 4.6 mile rolling leg and added another 45 seconds to the lead. Some of the earlier starting teams were becoming our victims with each successive mile. Larry flew into the exchange zone so abruptly he missed the handoff to Jeff Teeters, costing us 2 valuable seconds! Jeff was assigned the third toughest set of legs, which began with a rolling 6.1 miler. Just like Larry, Jeff pulled out another minute or so on the second place team, now positively identified as the 'Dirty Dozen' from WVTC. With over a five minute lead courtesy of Jeff, Alan Steeples tested his legs on a relatively flat 4.6 mile leg. Although the terrain was modest, the minimal shoulder and pitch-dark conditions made the going tough. Alan did his part and added to the EBS lead, now standing at around six minutes. Van B captain Thom Trimble took the bracelet from Alan and headed into the longest and most confusing leg of the day. (Thom was assigned the toughest leg grouping by nipping Brian McGuire at the previous week's cross country race.) Running on six inches of shoulder in darkness was bad enough, but throw in 1.2 miles of cow trails and a fading flashlight and things became really interesting! Unable to see much of a trail, Thom resorted to power-hiking most of the dirt section. After going off course twice, he was at last able to find the pavement again. Thom finished the 7.7 mile leg at just over 6 minute pace, but had given up half the lead in the process...DOH!! The evil WVTC team, like a bad date, came calling again. Mike Ignatius took the stick into the second longest leg of the day. His 7.1 miler culminated in a long steep hill to its finish. While the trailing Van got lost somewhere in Petaluma, Mike was able to make his way to the finish with only a minor off-course venture. Since the tone of the race was to be set by how each team stood after one full round of running, we were hoping to have a sizable lead after leg 12. The good news was that Mike held onto the lead. The bad news was that the lead was now merely ONE SECOND! Our hearts were in our throats as WVTC had slurped up our six minute cushion and was now looking for our sofa pillows! New-member Mike Kinter had the dubious honor of trying to regain EBS' pride, not to mention the lead. The early going of Mike's leg 12 didn't look promising as WVTC pulled ahead by 20-30 seconds early into the hilly 4.8 mile leg. The Van raced ahead to the exchange zone at the Cheese Factory with hopes that Mike would do his best at damage control. Arriving at the tumultuous leg 12-13 handoff zone, a couple of cheesy guys approached the team. It was Striders' Mike Frankfurt and Steve Brenneck, the invaluable EBS volunteers. After engaging in small talk for a few minutes, our focus returned to the handoff zone with the imminent arrival of Mike Kinter. Much to our surprise, Mike had not only caught the WVTC runner, but had put a full 80 seconds on him! While 80 seconds wasn't much in a 197-mile race, it was a huge mental advantage knowing we were the fastest team over the first round of twelve legs. Now it was time to start the whole routine over again, this time with all of a minute head start. Third place at this time was the Tarahumara team, a few minutes back. By the time Van A took the stick out in the countryside south of Petaluma, it was nearing Saturday morning, and pretty dark. As team captain Eric Ellisen started south, the only clue for seeing was the white line at the side of the road; mandatory flashlights did little to illuminate the way. On top of this, oncoming cars narrowed further the strip at the side of the road that was fit for running. Two miles into leg 13, the 'Dozen' caught the Striders again, and it would not be until San Anselmo, around leg 16, that the Striders would regain the lead. At this point, we were flying by earlier starting teams, and we felt for the first time that we might have a shot. Ken, Rob and Barton all ran strong legs; we had fun cruising the Red Hill Safeway in Fairfax early on Saturday morning while we waited for Rob. We were worried a bit about leg 17, with its complicated twists and turns, but Joe Schieffer navigated beautifully, and handed off to Brian for leg 18 with a healthy lead over WVTC. Brian drew the lucky assignment of running across the Golden Gate Bridge, although that included a pretty good climb up to the deck. The Van A group landed at the Presidio a few minutes before Brian came in; like back at the Cheese Factory near Petaluma, it was quite a scene here. Brian handed off to Larry, and the Van A's were off for a bit of rest. Van B raced up to the Presidio for its first nap time. Arriving at around midnight, we parked our bodies on the lawn with hundreds of other runners, trying to grab a few winks and wolf down some more PowerBars and Gels. Just as we were about to drift off, the cell phone broke the silence. Eric informed us it was deja-vu all over again. EBS had fallen behind WVTC early in their second set of legs, but was now pulling away again, as they approached the Golden Gate Bridge. It was now a two-team race as we learned that third place Tarahumara had become lost on leg 10 for over 20 minutes! Larry warmed up for his second jaunt of the day. In sharp contrast to the rolling hills of Napa, Larry would now contend with the streets of San Francisco. Larry took the 'stick' from Brian with nearly the same lead Van A had provided the previous round - three minutes. Before we could get the Van B sleepy-heads roused, Larry was gone. We charged after him minutes later. After driving nearly four miles without seeing any Strider singlet in sight, we realized the worst - Larry was lost! Doubling back on the course we eventually found him, running like a man possessed, cursing that he had gone off course for nearly four minutes. As a result, WVTC was now dead even with us again, another cushion gone. Our hopes for victory were sucked from us once again. Now, rather than relying on incremental gains over WVTC each leg, we had to bear down and run like we meant it. No coasting to the finish here! Larry took out his frustrations by putting 90 seconds on WVTC over the final four miles of leg 19. The question was, would he have anything left for his final leg? Mike Ignatius vowed that we would not goof up again and began issuing random orders left and right. The rest of us ate bagels and stared out the window of the van. Jeff blasted into his 5.9 mile rolling leg and continued to distance himself from all pursuers. At this point in the race we were passing slower teams every mile or so. This helped by giving us short-term goals throughout each leg. Jeff hammered up the steep finishing hill and handed off to Alan once again, this time with nearly a three minute lead. Alan plowed through his 6.5 mile leg 21, some of which was run on a bike trail. Vowing not to give up any time on his leg this round, Thom charged into his rolling 4.1 mile leg with a lead of exactly three minutes. Passing runners left and right added fuel to the fire and made him oblivious to his legs screaming: 'It's 3 AM you fool, we should be sleeping!' This time, rather than giving up 3 minutes, Thom had actually gained a few seconds on the pursuing Dirty Dozen guy - a critical blow to WVTC's psyche. Mike Ignatius did more of the same as he powered through his 3.7 mile leg. Close following by the van ensured that Mike ran only as far as he had to. Thom's yell of '400 meters to go' (in reality 800 meters) squeezed every ounce out of Mike's legs. Although he did not gain on his rival, he did limit the loss to just over a minute. EBS was looking good now, spirits were rising. Mike Kinter now had the luxury (burden?) of a sizable lead. The gradual climb on leg 24 to the Canada College finish worked out perfectly for Mike's running style. Rather than putting 80 seconds on WVTC, he was able to pile on another two and a half minutes, giving EBS a huge four minute lead at the two-thirds point in the race. Showering at Canada College, with Van A hard at work on the roads, faint smiles came over the team. We could actually smell victory for the first time! We were wrong...it was the potato piroshkis in the gym! We ate them as an appetizer anyway. It was the only real food we had eaten all day. After the rinse n' blintz we raced up into the Santa Cruz mountains to grab another faux nap before our last runs of the day. By now it's 6 AM on Saturday morning, and the Van A's, after a whole two hours of sleep, were up and ready to go for their last round. We were handed a four minute lead over the 'Dozen', and it was looking pretty good. Leg 25 had us running down toward Stanford and right into the approaching sunrise: beautiful. Even though Eric nearly took a wrong turn which would have landed him smack in the middle of an Interstate 280 offramp!, he was able to keep a slim lead on WVTC, about two minutes by the end of the leg. This lead we were never to relinquish, and in fact, extended it from this point on. From here on in, it was pure adrenalin and excitement, which built through the remainder of these legs. 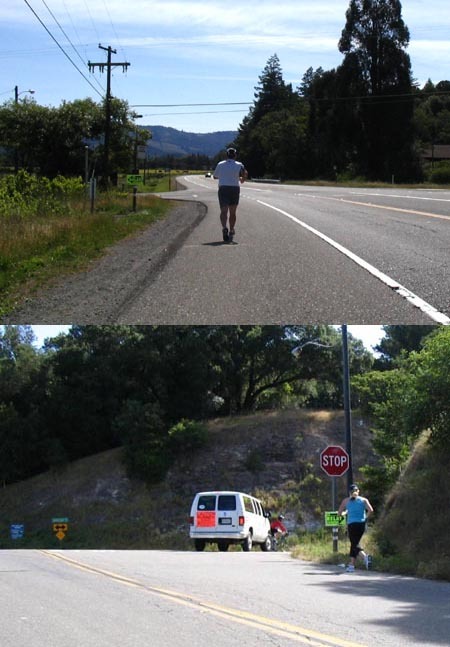 Ken, Rob and Barton all cruised their legs through Palo Alto and Portola Valley at or near 6 minute pace; Barton handed to Joe for leg 29, then the final work began for the Van A's. Joe and Brian, by the assignment of their legs, had drawn the two toughest of the 36, save perhaps for number 10 through the cow pasture in the dark. Their task was to make the climb up to Skyline Blvd, Highway 35, an elevation gain near 2,000 feet in a very few miles. Both Joe and Brian held near 7 minute pace on their ascents, and we handed off to the Van B's with a secure lead, and began a celebration of sorts, mostly because we were done! All that was left for the Van A's to do was drive the route, and cheer our compatriots on to victory. When we arrived at the exchange zone for leg 31 we were virtually alone. We had essentially passed all but a few of the 169 teams ahead of us. While a quick nap under the trees proved refreshing, what we were about to learn upon awaking did more than coffee could ever do. Narrowly escaping a citation from the park ranger for camping without a permit, the Van B Striders were packed and ready to commence their march to victory. Larry paced about the exchange zone showing little sign that this would be his third 'race' in 12 hours. The only thing that stood between us and victory was the possiblity of getting lost, or the quick recruitment of several Kenyans by WVTC. To reduce our chances of getting lost the Van kept very close tabs on each runner. For some strange reason, Larry's last leg was labeled as 'Moderate' despite the fact that it was all downhill. Larry surprised even himself as he flew through the 10K distance in an amazing 30:58! The lead now stood at around 15 minutes as Alan prepared for his final 5.5 mile meander thru the foothills of Santa Cruz. With the pressure off, the runs became a bit more enjoyable. The presence of daylight also buoyed our spirits. Alan still turned in 6 minute miles to record a solid 32:25 for his final effort of the day. Despite having the race in the bag, Thom still had to negotiate what turned out to be equal to the toughest legs of the course. While only 10K in length, the last 2 miles were straight up. While Thom clipped through the first four miles at 5:40 pace the last two were sheer agony. Clubmate Matt Urdan's advice of 'walk fast' was taken to heart as Thom pressed up the last stretch to finish his leg in 37 flat. At this point EBS had passed all but one of the teams in the race. Mike Ignatius got a taste of The Hill for the first mile of his leg but was able to enjoy a relaxed downhill for the remainder of his 6.5 mile leg. With few turns on his leg, Van B raced ahead to the final handoff zone to prep Mike Kinter for his 12-turn final leg. We vowed to 'shadow' Mike for the entire last leg to ensure our victory didn't end up traveling down Route 1 towards Watsonville. Mike decided to hold 6 minute miles to prevent any possiblity of crashing over the last 6.1 mile leg. Van B met him at nearly every corner. With 2 miles to go, and Mike safely past the last junction, both Vans met at the Boardwalk to prepare for the victory dash across the finish line. Mike appeared on schedule and escorted the 11 other happy but trashed team members onto the beach and across the finish line. Despite the 1997 course being 3 miles longer, EBS had crushed the old record by over 30 minutes! The club was able to enjoy the limelight and interviews for a full 14 minutes before our new arch rivals, Ottaway's Dirty Dozen, appeared on the scene.